I have migrated to new blog. Click the link below to redirect. I begin to learn ruby on rails since begin of this August. I found out that ruby on rails is awesome, it speed up all my works and make it simple to maintain. So, I wrote this article to introduce about how awesome rails is. Back to our topic, what is ruby on rails? Web application development framework with ruby language. For more details, you can do some searching on what is ruby on rails, there are many sources you can found on internet. It is always easier to be understood by running up the things. To install rails on your windows or mac PC. There is a quick way to install it by download rails installer and install it. To install rails on linux os such as ubuntu, debian might needs a little bit more works then windows and mac. There are sources on internet, check it out. Rails, will do it automatically for you. By typing a few commands for it, rails will do it for you. Here’s the commands. On first command, create new project and name it "NewProject". Second command create table name item and columns of name, price and description. Third command create directory for html file, ruby file and routes. Fourth command to startup database and last command to startup the server. Everything will be setup within 1 minutes. It means, you can begin your programming after 1 minutes. Cool right! Go to http://localhost:3000 and you will see the welcome message of rails. The page is blank. This is because all you have generated is database, system and routes. There will nothing to show unless html code is written. A powerful tool that prepared by rails called Scaffold. Scaffold will generate everything including database, simple system code, traffic, html layout code. It means, you can begin to coding from half way instead of blank file. Then, generate scaffold with following command and startup server. Instead of blank project, scaffold will generate a template for us to make a quick way to start. It is the end of the article, do you think that ruby on rails is awesome? If you are working on key action with jquery and having problems on event.preventDefault is not working. Let’s me explain something simple to you. As given example on docs, it shows us how it works on click action. For instances, prevent default action of anchor request the given url when clicked, action of submit button clicked to submit the form. preventDefault is good but when it comes to key action such as enter key on submit form and tab key on switching the focus of input element. It lose it effects. 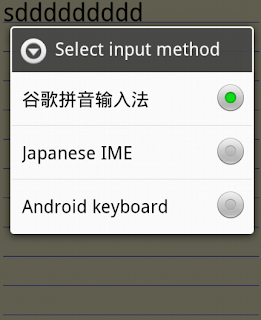 You will found out that enter key are still performing default action and others key as well. So… what is the solution? Adding return false on handler. Snippets below shows an simple example on this solution. What happens if you want only ‘enter’ key to be prevent default action. Here’s the solution. Enter keycode is 13. Return true on event handler will allow the key to continue with default action and return false will stop event handler from continue to default action. There are a few quite common mistake make by people, especially for me. Either you too? If there is errors (exp. syntax errors) occured inside the handler function, default action will be carry out even though there is return false in handler function. Don’t tried to ignore the errors that shows on your browser, it might be the core of your problems. What does it means? Check it out with the differences at following codes. If you have do some checking by Object.keys( $(“ul”).children(“li”) ); you will found out that the properties is different from jquery properties. High level language doesn’t means you don’t have to understand the basic of it. Understanding basic sometimes will be the helper on solving problems. 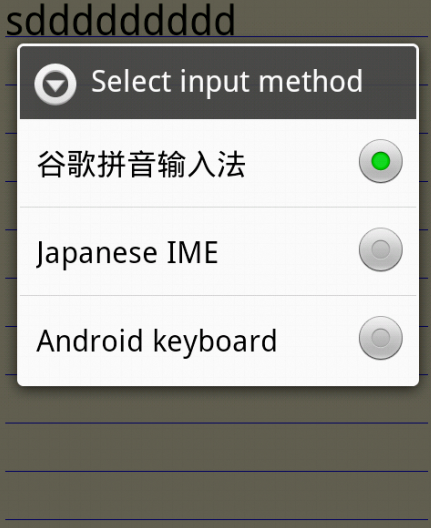 Here's the snippets for Android to open the select input method option menu programmatically.